Earlier today I was catching up on some tidbits of world news from various sources when I stumbled across something that caught my eye. 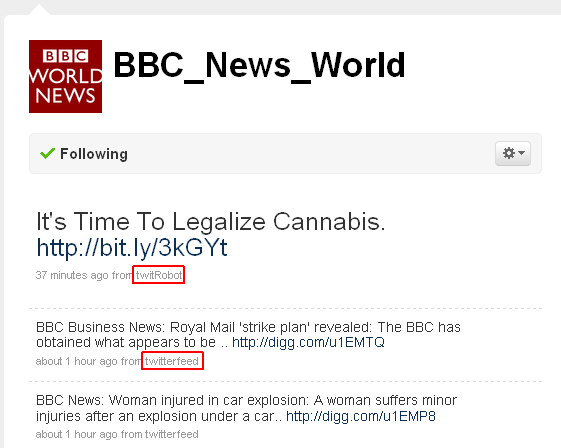 BBC World News offer a twitter feed of their latest headlines. I sometimes browse the list to see whats going on in the world and to reaffirm my opinion that we’re all doomed. Today however a specific article in the list caught my eye. Whereas all other tweets come from Twitterfeed, these are the only ones that report to come from twitRobot. Very strange. 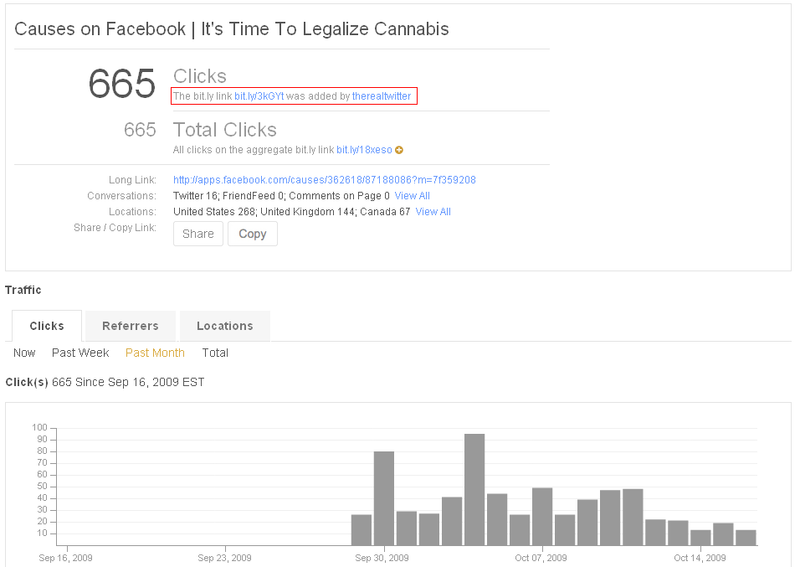 By pulling up the link on a test system the bit.ly link took me to a Facebook cause with the same title at the tweets posted through the BBC Twitter feed “It’s Time To Legalize Cannabis”. By pulling up the bit.ly statistics I could see that this link had been actively used since the end of September and had been clicked over 665 times. It also showed the original creator of the link as a user called therealtwitter. This appears to be the name used when Twitter automatically shortens a URL in a post for the user. So no tracking information there unfortunately. More detailed information can be found on the bit.ly info page for this link. Including breakdown of clicks by country and clicks by referrer. By looking at the referrer stats it’s evident that this bit.ly link is also being sent out through email and IM. Although the Facebook cause at the end of the link appears benign at first appearance, it certainly warrants further investigation into why this link is spreading through the BBC Twitter feed (possibly without their knowledge). This cause could be something as simple as a person trying to drum up members for their cause. Then again it could just as easily be a phishing site designed to steal logon credentials, or perform attacks against the users browser. Further work is needed to see exactly whats behind this. If I receive response regarding this I’ll certainly post a followup. Until then, watch out just incase.